Upon entering the beautifully restored sanctuary at the Museum at Eldridge Street, visitors are transported back to the height of the synagogue’s glory. Built in 1887 during the rise of Jewish immigration to the Lower East Side and restored in the 1980’s after a period of neglect and disrepair, the building is a perfect reflection of the past, present, and future of this historic neighborhood. 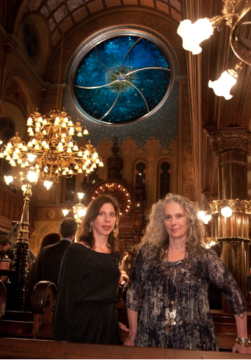 Today, the synagogue’s sanctuary is covered from floor to ceiling in painted patterns and sparkling ornamentations, all twinkling in the shafts of light that emanate from the Museum’s newest and most distinctive feature: the exquisite stained-glass window designed by artist Kiki Smith and architect Deborah Gans. 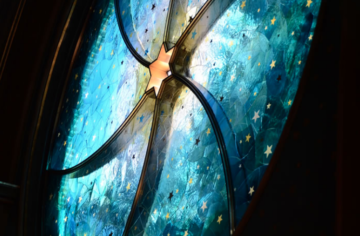 While the restoration of the sanctuary remained faithful to historical accounts of the synagogue’s 19th-century interior, the new window is an intentional departure from the past. It represents a bright and colorful future for both the Museum and the neighborhood. Designed and installed in 2010, the Kiki Smith and Deborah Gans window is a shining treasure of the Museum and attracts countless art enthusiasts each year. 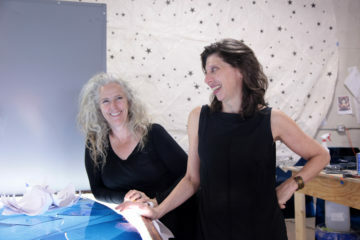 At an open house reception on July 25, we’ll have the pleasure of welcoming Deborah to the Museum to discuss her collaboration with Kiki Smith, her prolific career as an architect, and her connection to the Museum at Eldridge Street. In preparation for her talk, we asked Deborah to answer a couple questions. Have your own questions for Deborah or interested in hearing from her yourself? Join us from 6:00 to 8:00 p.m. on July 25th for the free reception in our historic sanctuary. Gans describes her work as an architect as “part of a continuum of thinking between past and ever-evolving work.” The ideas behind her unique projects are not born in a vacuum, but rather exist together, constantly interacting and supporting each other. While the monumental scale and pioneering technique of the Museum’s window made it a particularly meaningful project, Gans has executed projects for numerous other synagogues. Each one is totally unique and tailored to the community’s needs. Join Gans on July 25th to hear even more about her art, her process, and her connection to our landmark! Doors open at 6:00 p.m. and Gans will begin her talk at 6:30. An abridged tour of the building will also be offered, beginning at 7:00 p.m. We hope to see you there! Amelia Geser is a summer intern at the Museum at Eldridge Street. She is in her final year at Grinnell College, studying Art History.